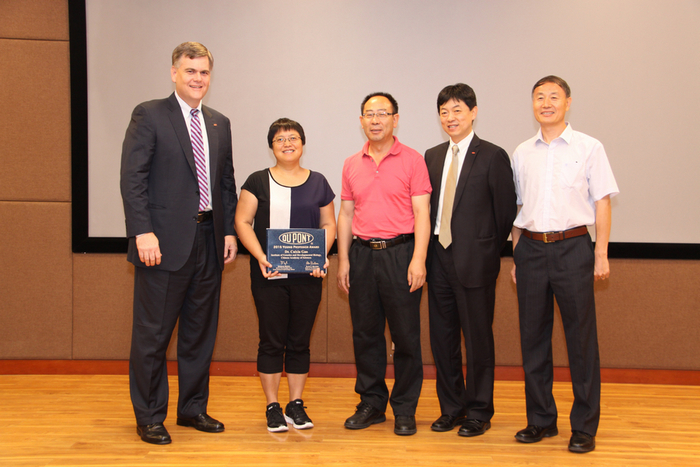 Prof. GAO Caixia from the Institute of Genetics and Developmental Biology, Chinese Academy of Sciences, was presented DuPont Young Professor Award by the DuPont Company on July 27. Dr. William D. Provine, the Global Technology Director of DuPont, accompanied by Dr. Gary Gu, the Regional Technology Director of Asia Pacific & General Manager of China R&D Center, and Dr. Guihua Lu, the Senior Research Manager of DuPont Pioneer, visited the Institute and attended the awarding ceremony. Dr. YANG Weicai, the Director of the Institute, hosted the delegation. Nine young scientists from five different countries received the 2015 DuPont Young Professor Award. Dr. GAO Caixia was elected for her achievements in genome editing in crops and the working on identifying the candidate regulatory pathways of drought tolerance in maize. The DuPont Young Professor program is designed to supports non-tenured young research faculty working in areas of interest to DuPont within 5 years of their research careers. Since 1968, DuPont has provided over $50 million in grants to greater than 700 young professors in more than 140 institutions in 19 countries.